Robert Wilson's Aida comes to DVD. Sometimes impulse purchases have wonderful results. 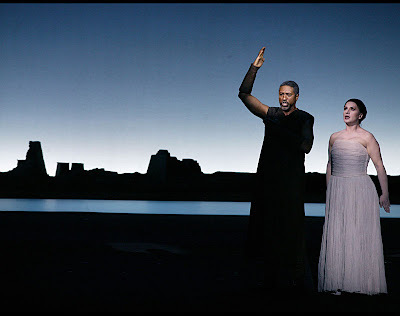 In this case, my curiosity about Robert Wilson's conception for "Aida"--and how the director, known for his stylized gestures and near-empty stage sets would approach this most crowded of Verdi operas. Would Wilson's near-uniform style of acting and directing--stylized hand movements, kabuki-like makeup and ultra-slow stage movement--mesh at all with the red-blooded world of Verdi's mythical "Egyptian business"? The answer is, yes they do--sorta. Wilson keeps things simple in this visual presentation, using just enough in the way of visual reminders to tell the viewer that they are, in fact, in Egypt. His Egypt, with deep indigos, blues and blacks substituting for the usual desert colors. The three pyramids at Giza are picked out as chrome frameworks that suggest visual depth. The Nile is a blue stripe across the all-black stage. And the Egyptians move like tomb paintings come to life--the clear inspiration for Wilson's hand-gestures and stylized movements. It is refreshing, for me anyway, to subtract the usual sandstone clutter and King Tut bling that is usually found in this opera. The fact that there is less to look at highlights the singers, who are pretty good--not great. Norma Fantini's Aida is the best of the lot: elegant and regal, capturing much subtlety with her eyes and facial movements, especially when she is out of Amneris' line of sight. Her two big arias are beautifully rendered. Ildiko Komlosi is ice-cold and regal in this part--no wonder Radames finds her tough to love. The facade cracks in the big Act IV scena. Mark Doss is an excellent, passionate Amonasro--he recalls a young Simon Estes. Only tenor Marco Berti seems out of place--but as Radames is essentially a passive character this doesn't necessarily kill the evening. Kazushi Ono takes the brisk, lucid approach to conducting this score, managing the tricky choral ensembles and tempii with skill and a steady Verdian beat, building up to the occasional explosive "thump" on the bass drum. in Act I of Simon Boccanegra. The Met revives Simon Boccanegra. We were at the Met last night to catch the revival of the company's excellent revival of Giancarlo del Monaco's 1995 staging of Verdi's Simon Boccanegra. Ably conducted by Fabio Luisi and anchored by a stellar portrayal by Thomas Hampson, this was an emotional reading of this underperformed opera. 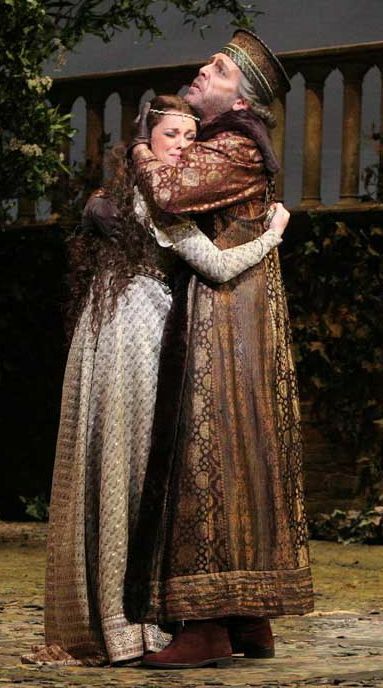 The star of the evening was Angela Gheorgiu, who grabbed the audience's attention as Amelia and proceeded to bring out the warmth and depth of Verdi's heroine. She blended well with Hampson, and the two generated real emotional pathos in the "Figlia" duet. Hampson was a multifaceted Doge--a loving father, a thundering statesman and finally a dying martyr. This is a very complicated part and he was able to portray Simon with dignity and vocal versatility. His "O patrizi, plebei" made the arches of the Met's massive Council Chamber resonate, his agony while dying in the third act was almost painful to watch. Mention must also be made of Marcello Giordani, who made the most of the underwritten tenor part of Gabriel Adorno. I have never seen this part this well portrayed--not as a tenor afterthought but as a character almost as complicated as Boccanegra himself. Ferrucio Furlanetto was a vocally imposing Fiesco, nailing all of the killer bass notes in "Il lacerato spirito" but coming off more as a kindly uncle than a proud nobleman hell-bent on revenge. Vassily Gerello had some rough spots in the prologue--he plays the key role of Paolo, the opera's real villain, and gets the job of telling the audience what the hell is going on in the opera. However, Gerello evened out and sang very well in Acts 2 and 3. That production has held up pretty well, although the image of the angry Genoese mob pulling down a statue in the opening prologue--once meant to portray the death of Communism, eerily recalled events in Iraq following the fall of Saddam Hussein. As it often is at the Met, the massive sets require that intermissions be at odd times (between the Prologue and Act One?) which makes the evening longer than necessary. But these are minor quibbles. So I'm in the Virgin Megastore last night in Times Square, perusing the classical department--or what is left of it. When this store opened, the classical music section took up nearly two rooms. Now, it's two racks and a wall display. Still well-stocked, but small--and I couldn't find the Brahms serenades I wanted. In the last ten years, the classical music recording industry underwent a rapid downsizing. Long gone are the good old days when operas would be recorded simply to satisfy a singer's ego (Pavarotti's disastrous Otello comes to mind) or a conductor's. Sometimes the latter projects would move forward even if the singers weren't available--does anyone remember the aborted Decca Ring Cycle that they couldn't find a qualified Siegfried for? Now granted, the last ten years haven't been a total disaster--there are still good, important opera recordings being made and the market is flooded by a lot less crap. Better digital remastering processes have resurrected many classic recordings, at lower prices, that sounded thin and gritty in their initial CD releases. And improvements in CD packaging (mostly the elimination of the jewel case in large box sets, e.g. the DGG Collector's Edition) have gone from door-stops to pocket size, making room for more good music on the shelf. But it's still not a perfect world. The death of Tower Records and the downsizing of large retail chains has hurt the sense of community among listeners--to put it simply there are fewer places to hang out and geek about the music we are all so passionate about. Maybe some enterprising individual should start "listening clubs" or "music lounges"--but then if we were all there and plugged into headphones there wouldn't be any dialogue either. On a more cheerful note, I picked up a couple of interesting box sets--including a compilation of Daniel Barenboim's '70s recordings of Chopin, Mendelssohn, and Liszt, including some rare Wagner transcriptions that I'd never heard before--and a Beethoven cycle by Emil Gilels, left unfinished due to the death of this great pianist. Last night, the New York Philharmonic opened their 2007 Brahms festival with a performance of the composer's Serenade No. 1 for Large Orchestra and the mighty Piano Concerto No. 1 in d minor. These two works are roughly contemperaneous with each other, written starting in the 1850s, a period when Brahms was overcoming his doubts about succeeding Beethoven in the world of Viennese serious music--and starting to explore working with an orchestra. In fact, if the Seranade had four movements and a more regular structure, it might qualify as a symphony, as it is, it is an interesting hybrid. In this Serenade, which is among his first major orchestral compositions, the young Brahms juxtaposed the the stormy romanticism of Beethoven with the courtly formalities of Mozart. It is a six-movement work, with multiple dance movements or scherzi, a baroque structure that is used to express a distinctly classical idiom, in a romantic, yet conservative style. In other words, it is unmistakeably Brahms. 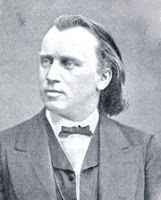 Brahms' influences are clearly visible on his sleeve in this composition--yet his own voice is apparent as well: the whole is underpinned by a thick, textured harmonic sensibility. 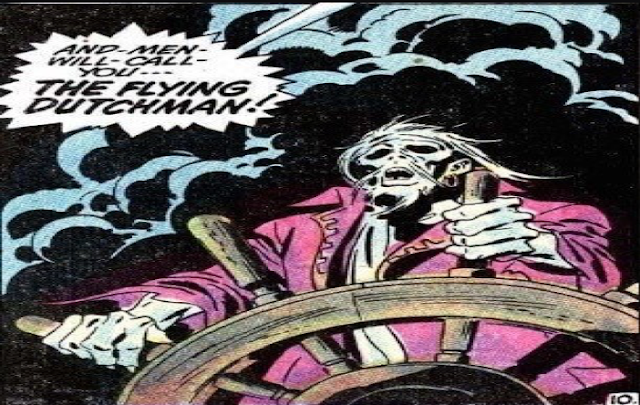 This is a Brahms trademark. Lorin Maazel led an energetic performance, bringing out the power and muscle of this piece but allowing the beauty of the woodwind writing and careful string figures to shine through. The Philharmonic's powerhouse horn section (led, as always, by principal horn Philip Myers) is to be commended for their superb playing. The second half of the program featured Emanuel Ax at the soloist in the d minor concerto. Lorin Maazel conducted a robust, juicy performance, the big chords of the opening theme echoing against the delicate second theme, Ax was accurate and passionate at the keyboard, racing through the difficult passages in the big first movement, even snapping a string on his piano towards its close. The second movement moved with lyrical grace, bringing forth the composer's evocation of the beauties of the natural world. The finale was a race between piano and orchestra, blazing through the final rondo with the occasional foray into Bach-like fugue along the way. The difficult final cadenzas were played with energy and skill, and conductor and soloist blazed home through the final coda. Thanks to the 11th-hour generosity of my uncle, we found ourselves in possession of tickets to Carnegie Hall (again!) on Wednesday night. We ventured out in the snow to see the Minnesota Orchestra play symphonic works by Sibelius and Beethoven, the former's Fourth Symphony and the latter's mighty Fifth. Osmo Vänskä conducted. The program opened with In Memoriam, a Sibelius symphonic poem commemorating the death of Finnish freedom fighter Eugene Schauman. Schauman assassinated General Nikolay Bobrikov, a harsh administrator appointed to rule Finland by Tsar Nicholas II. Shortly after assassinatin Bobrikov, Schauman took his own life. In his memory, Sibelius composed a dark, funereal piece, in which the influence of Gustav Mahler (particularly the Fifth Symphony) can be clearly heard. This was followed by the equally serious Fourth Symphony, a work written during a period when Sibelius thought that he was battling with throat cancer. It is one of Sibelius' darkest compositions, asking many musical questions but not necessarily resolving itself. Mr. Vänskä produced exceptional clarity of sound from his Minnesota forces, who may have brought the bad weather with them but were nonetheless welcome on the Carnegie stage. The second half of the concert featured a vigorous reading of Beethoven's famous Fifth. Mr. Vänskä made intelligent performance decisions, maintaining Beethoven's rhythmic figures while providing welcome surprises to the ear. The third movement was taken at a brisk, energetic pace. The ascending figures at the end of the movement created a sense of anticipation, setting up the explosive theme that opens the finale. 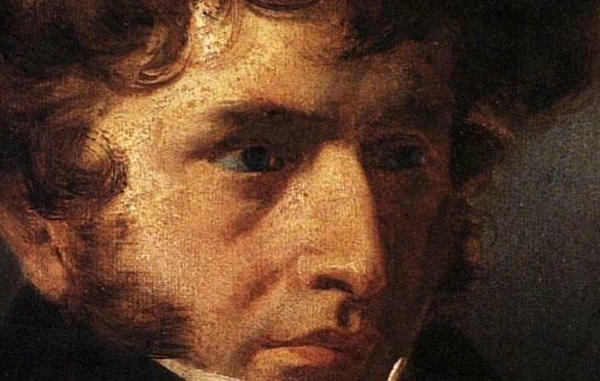 The last movement--one of Beethoven's most exhilarating, was both bright and triumphant. 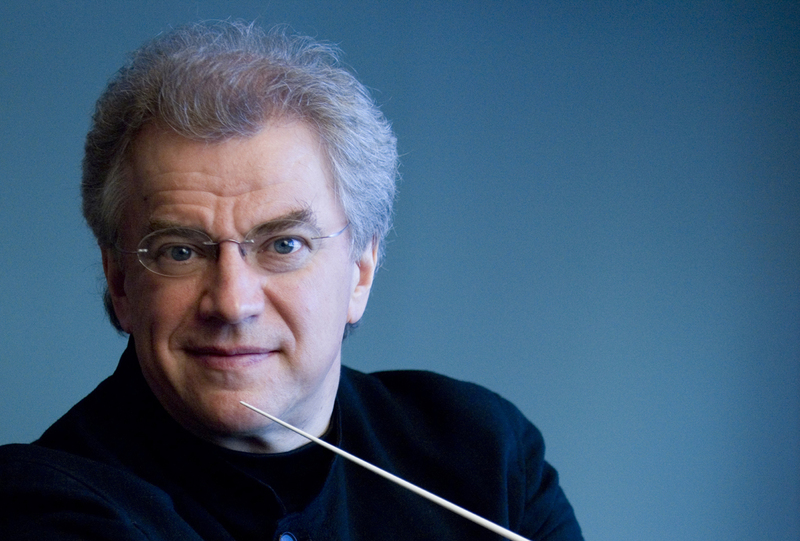 Mr. Vänskä is currently recording the nine Beethoven symphonies for BIS--this may be a cycle worth looking forward to when it is complete. We went to three concerts this week, and I am going to try to start things off right by reviewing Monday night's performance of Berlioz' The Damnation of Faust at Carnegie Hall. Hector Berlioz was one of the geniuses of 19th century French music. Although he had many struggles in his career, he achieved great success with the Damnation of Faust, the result of 17 years of hard work on his part. After reading Goethe's Faust, he immediately set about composing it, conceiving an eight-scene drama. Eventually, the composer compressed the action and expanded the orchestral score, resulting in the four-act "symphonic drama" that became the most popular of Berlioz' large-scale compositions. Although it can be performed as a fully staged work (and was the last time I saw this piece at BAM), the composer intended his work for the concert hall, not the opera house--and that is how this performance was staged, with singers and orchestra in tuxedos--with nary a pitchfork in sight. Paul Groves, fresh off his performances in Tan Dun's The First Emperor was an able Faust, singing sweetly in the beginning and giving a powerful rendition of the callow scholar's fall from grace. He struggled with some of the high tessitura, but for the most part, his evening was a success. Wielding the pitchfork as Mephistopheles was the great Belgian baritone Jose Van Dam, now in his 60s but still velvet-voiced. He caught the sardonic humor undercut with cold steel that is needed to play this devilish role. Mezzo-soprano Yvonne Naef was a decent Marguerite, singing a heart-wrenching "Roi de Thule" aria and a moving Spinning-song. Mr. Levine conducted a well-balanced, carefully thought out reading of the score, anchored by a dulcet string section and powerful brass. Interestingly, a tuba was used in conjunction with an ophicleide, a kind of proto-tuba that Berlioz actually specified in his score. You don't hear ophicleides much in the concert hall, and its loud, rude honking was effective in the tavern scene. The chorus gave a knockout performance, especially in the Pandemonium scene where they portray capering demons, and all start singing in gibberish. Very Lovecraftian, that.